For Prelims and Mains: Battle- causes, effects, features and significance. It is considered one of the fiercest battles of World War II. It was fought by Ordnance personnel of 221 Advance Ordnance Depot (AOD) on the night of 6/7 April 1944 against Japanese forces. Japanese forces had planned a three pronged offensive to capture Imphal and the surrounding areas. In their attempt to extend their line of communication to Imphal, the 33rd Japanese Division cut in behind the 17th Indian Division at Tiddim (Mynmar) and establishing themselves firmly on the main Kohima – Manipur highway, started advancing towards Kangla Tongbi. However, combatant role of AOD personnel shook the enemy and forced the Japanese to withdraw. The Kangla Tongbi War Memorial is a mute testimony to this battle and the unflinching devotion to duty of the Ordnance personnel of 221 AOD, 19 of whom made the supreme sacrifice. It conveys to the world at large that Ordnance personnel, apart from being professional logisticians, are second to none in combat, being equally proficient soldiers, should the occasion demand. For Prelims and Mains: Who is a Service Voter, how can he cast vote, significance and challenges associated. Context: The soldiers of Indo-Tibetan Border Police (ITBP) were the first to cast their vote for the 2019 Lok Sabha elections in Arunachal Pradesh as Service Voters. There are roughly 30 lakh service voters including defence and paramilitary forces who (in many cases with families at family stations) will cast their votes through service voter facility. Who is a service voter? Being a person who is employed under the Government of India, in a post outside India. How is a service voter different from an ordinary elector? While an ordinary elector is registered in the electoral roll of the constituency in which his place of ordinary residence is located, person having service qualification can get enrolled as ‘service voter’ at his native place even though he actually may be residing at a different place (of posting). He has, however, an option to get himself enrolled as general elector at the place of his posting where he factually, at the point of time, is residing ordinarily with his family for a sufficient span of time. Are members of all Armed Forces / Para Military Forces eligible to be enrolled as service voters? As per the existing arrangements, members of Indian Army, Navy and Air Force and personnel of General Reserve Engineer Force (Border Road Organization), Border Security Force, Indo Tibetan Border Police, Assam Rifles, National Security Guards, Central Reserve Police Force, Central Industrial Security Force and Sashastra Seema Bal are eligible to be registered as service voters. Is wife or son/daughter of a service voter also enrolled as a service voter? The wife of a service voter shall, if she is ordinarily residing with him, be also deemed to be a service voter in the constituency specified by that person. The service voter has to make a statement to the effect in the relevant Form 2/2A/3 that his wife ordinarily resides with him. The wife will be enrolled as a service voter on the basis of declaration made by her husband in the application form itself submitted by him and no separate declaration / application is required to be made by the wife. A son / daughter / relative / servant etc. residing ordinarily with a service voter cannot be enrolled as service voter. Is facility of enrollment as a service voter available to the husband of a female service voter? Under the existing law, this facility is available only to the wife of a male service voter and is not available to the husband of a female service voter. Can one be enrolled simultaneously as a service voter at his native place as well as a general voter at the place of posting? No. A person, at a particular time, cannot be enrolled as a voter at more than one place in view of the provisions contained under Sections 17 and 18 of Representation of People Act, 1950. Likewise, no person can be enrolled as an elector more than once in any electoral roll. Service voter belonging to Armed Forces or forces to which provisions of Army Act, 1950 are applicable, has 0ption of either voting through postal ballot or through a proxy voter duly appointed by him. A service voter who opts for voting through a proxy is called Classified Service Voter (CSV). A service voter may appoint (by applying to Returning Officer in Form 13 F of Conduct of Elections Rules, 1961 – Form available at the website of Election Commission) any person as his / her proxy to give vote on his / her behalf and in his / her name at the polling station. The proxy shall have to be ordinary resident of that constituency. He need not be a registered voter but he / she must not be disqualified to be registered as a voter. The provision for voting through proxy is valid till the person making the appointment is a service voter. For Prelims and Mains: Procedure and criteria for the post of President of World Bank, functions. Context: David Malpass has been appointed as the President of World Bank. He was nominated by the US president Donald Trump. Ability to articulate a clear vision of the Bank’s development mission. To win the presidency of the World Bank, a candidate must win approval from the institution’s executive board, which has 25 members. The US holds a 16% share of board voting power hence more often it is the US-backed candidate gets elected for the post of the president. For Prelims: PMU- key features. Context: According to a recent survey, most rural households with LPG (liquiefied petroleum gas) connections still use chulhas with firewood or dung cakes, to the detriment of rural health. 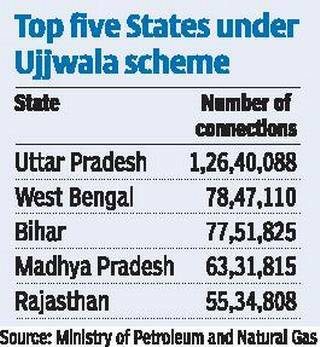 About 85% of Ujjwala beneficiaries in four States still use earthen stoves- rural Bihar, Madhya Pradesh, Uttar Pradesh and Rajasthan. The resultant indoor air pollution can lead to infant deaths and harm child development, as well as contribute to heart and lung disease among adults, especially the women, cooking on these chulhas. Almost 70% of households do not spend anything on solid fuels, meaning that the relative cost of an LPG cylinder refill, even if subsidised, is far higher. Women are more likely to make dung cakes, and while men are more likely to cut wood, women are often the ones collecting and carrying it. The study argues that these women, who do the unpaid labour needed for “free” solid fuels, are not typically economic decision-makers in the household, hindering a shift to LPG usage. The PMUY is a bold and much-needed initiative, but it should be recognised that this is just a first step. 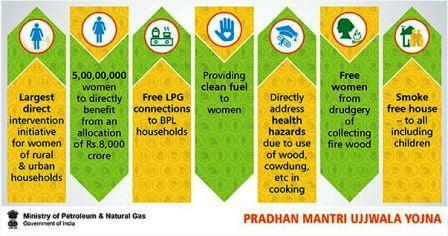 The real test of the PMUY and its successor programmes will be in how they translate the provision of connections to sustained use of LPG or other clean fuels such as electricity or biogas. Truly smokeless kitchens can be realized only if the government follows up with measures that go beyond connections to actual usage of LPG. This may require concerted efforts cutting across Ministries beyond petroleum and natural gas and including those of health, rural development and women and child welfare. What is it? The J&K govt. has issued an order banning the movement of civilian traffic on a 270-km stretch (Udhampur-Baramulla) of the Jammu-Srinagar-Uri national highway for two days every week. On Sundays and Wednesdays, the highway would be exclusively used for movement of military convoys. The decision has been taken considering the security concerns that led to temporarily blocking part of the highway. However this has an implication on civilian population. Why is the highway important? The Jammu-Srinagar-Uri national highway (NH-1A) runs 370 km. The national highway is not just the only road link that connects Kashmir to the outside world but also the key highway that connects Srinagar with the southern and northern districts of the Valley. The highway passes through five of the 10 districts of the Valley, and highways to at least two more districts branch out from it. The highway, directly and indirectly, impacts a population of over 69 lakh. The government has cited the recent suicide bombing of a security forces convoy in Pulwama — which killed 40 CRPF personnel — as the reason for restricting traffic. It means a virtual lockdown of the Valley for two days every week. According to official figures, over 10,000 vehicles move on the highway from both sides every hour, including around 5,000 light motor vehicles. These include vehicles carrying students, patients, government officials and businessmen. Closing the highway during daytime would mean that most government and private offices, banks, schools and colleges would remain shut on Wednesdays and the movement of people to hospitals would be severely restricted on Wednesdays and Sundays. Whenever security forces’ vehicles are using the highway, civilian traffic can be halted for various lengths of time.